I'd like to see or hear your suggestions on storing files. I know keeping them in a drawer is not good. I have several drawers full of them. I need to do something different. Thanks. I store mine in a shallow drawer. I made Dado cuts, the thickness of my files, in a piece of 1 inch maple then screwed the strip down in the drawer with the cuts facing up. I turn the files on edge and lay them in the cuts. I have photos of a rack for my rasps, it is made of oak with short pieces of PVC pipe to stick the ramps in. I just haven't gotten "round to it" yet! I make wooden "combs" about 2" wide, with 1/4" to 3/8" gaps. These are spaced to allow the thickest handles to sit side by side. A second piece of wood is screwed vertically onto the back of the comb, to allow the rack to be screwed to a vertical surface. I do have my files marked with a piece of red electrician's tape if they are to be used only on wood. 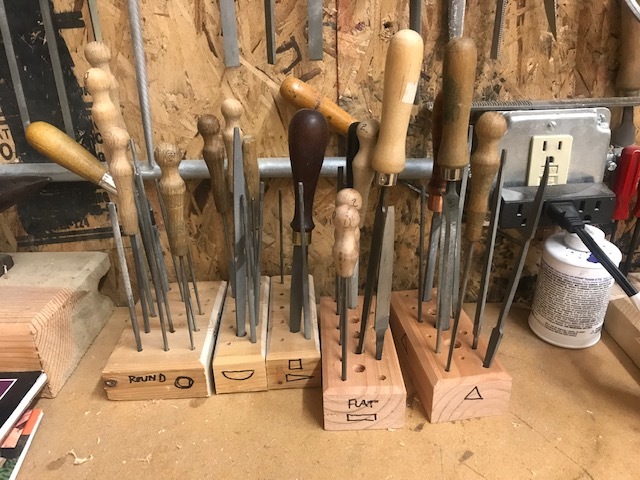 There are also separate racks for metal or wood files, the tape just allows me to quickly identify which is which when returning them to the rack. Needle files are kept separate in a rack which has vertical holes drilled. Used a piece of 2 x 4 for the last one. Make the holes large enough to accept the file which goes there, and just deep enough to keep the file teeth covered. I think I have at least 10 sets of these, in varying shape and cut. Again, try to keep wood needle files separate from metal cutting files. 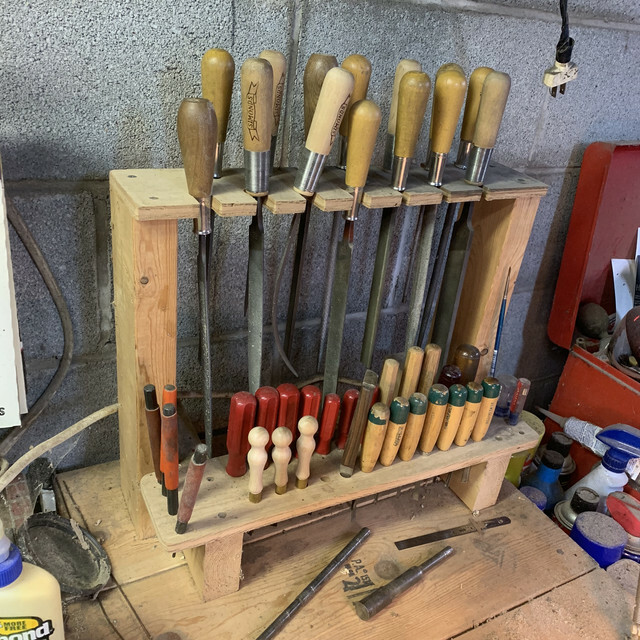 I have mine in "wooden combs" too above my bench......mount the flat horizontal comb at a slight upward angle, keeps the mystery to a minimum as to why one big file just decided to fall out on a finished stock. I've struggled with that as well. I have no drawers available, so currently I do much as the guys above do, on the wall. The bigger ones are in a strip of wood with a hole to fit the ferrule of the handle, then a notch cut to it. The file will stay there without falling out, and must be lifted up before pulling it out. The smaller ones below them just have holes. The wall is all OSB panels and I can screw things anywhere I want, so I just drilled and screwed the rack directly to the wall. The needle files are in blocks of wood with holes. Just last week I got tired of trying to find the one I wanted in the single miniature forest with all of them in it, and separated them into separate blocks by shape. I look forward to other ideas, as this does take up a lot of wall space, but I can see the one I want at a glance and get it. I kinda have them sorted by cut on the rack, coarser to finer, to make it a bit easier. I'm about to run out of room though. The heavier ones have fallen out of the handles at times if dropped in the rack too hard, but it's a ways from any work on the bench so no harm except sometimes to the handle below. 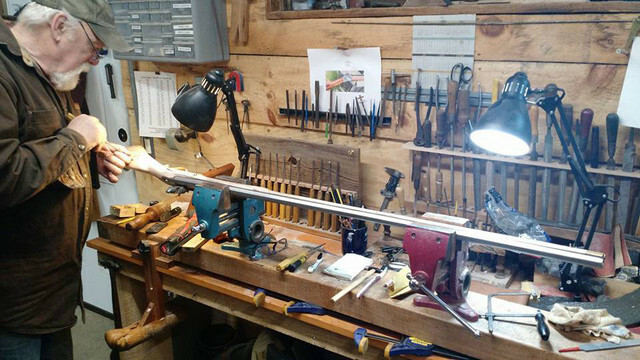 I just make paper or cardboard scabbards for each file, and store them in a drawer in my machinists tool chest, or in a box. The exceptions are the mass of old files I've picked up at the local flea market, which are wrapped up in plastic bags in such a way as to keep a layer of plastic between each file and it's neighbor. When I get them sharpened I'll make sheaths for them too. Here are two holders I made, one for files and the other for rasps. They have a lazy-susan bearing on the base, so I can rotate them to access whatever tool I need. The design was based on ideas I got from the guys on the Practical Machinist Forum. 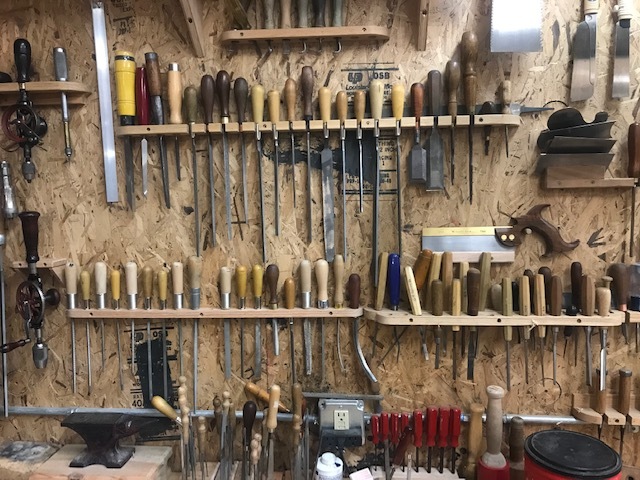 I keep most often used files in a vertical rack behind the bench, most often used chisels to the left and punches and cold chisels and miscl pliers on magnetic strips above. I have a square balk of oak about 3 1/2" square x 48" long. In it I drilled three rows of holes about two inches deep. I store most of my files there without their handles which are in a drawer. Many of the finer files I am able to leave the candles on. 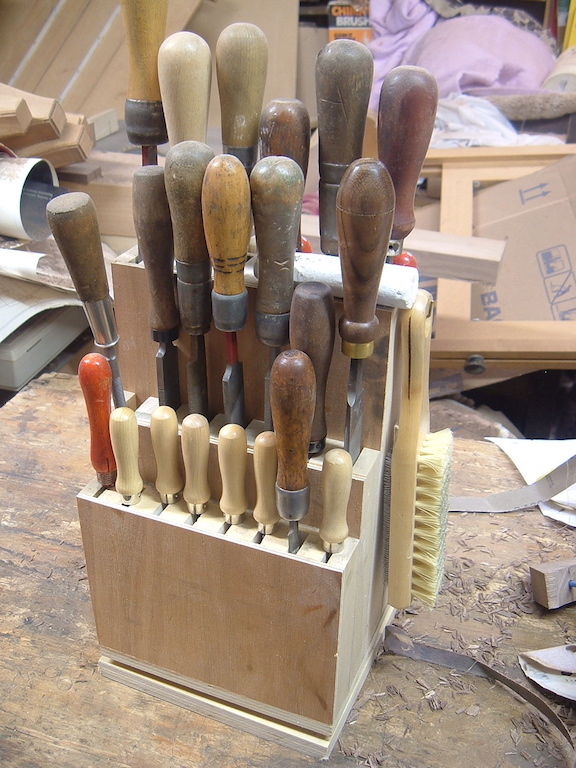 I have another similar chunk with four rows of finer holes for my skinny files like triangular etc. And I have a tray under my bench with my new file collection, all wrapped in butcher paper. I have a lot of files. I went overboard on my file storage. 2x4 with holes punched in it. That is what I do. I have separate ones for wood file, needle files, metal working files etc. Makes them easy to move around. If you end up with more files than holes, just get another scrap piece of 2 X 4 and drill some more holes. I do finish them with sanding and spray varnish just because.